(D) The Competition will be known as the Surrey Primary League (or such other name as the Competition may adopt). For clubs registering players under Rules 8(A) (i) registration forms will be provided in a format to be determined by the Competition. (iv) Register for a team in the competition and subsequently play in an older age group without first completing a transfer form. (H) Subject to compliance with FA Rule C 2(a) when a Club wishes to register a Player who is already registered with another Club it shall submit a transfer form (in a format as determined by the Competition) to the Competition accompanied by a fee as set out in the Fees Tariff. Such transfer shall be referred by the Competition to the Club for which the Player is registered. Should this Club object to the transfer it should state its objections in writing to the Competition and to the Player concerned within 7 days of receipt of the notification. Upon receipt of the Club’s consent, or upon its failure to give written objection within 7 days, the Secretary may, on behalf of the Management Committee, transfer the Player who shall be deemed eligible to play for the new Club from such date or 7 days after receipt of such transfer. (I) A Player may not be registered for a Club in the Competition after 1st March except by special permission of the Management Committee. (P) Immediately prior to the commencement of a match the appointed Club Representative of each team shall present themselves to the opposition Club Representative to exchange and check the validity of the Surrey Primary League Player Registration Cards (paper or electronic). Any team that fails to correctly check the eligibility of players through this process shall be liable to a fine as follows: First Offence £25.00, Second Offence £50, 3rd and subsequent Offences £75.00. (Q) In the event that a player’s Surrey Primary League Player Registration Card is not available for production the matter shall be brought to the immediate attention of the opposition Club Representative and reported to the match Referee (whether qualified or not). Both Clubs shall submit a report to the League Secretary no later than three days following the playing of the match, providing the name and date of birth of the player and reasons for the non-production details of the Surrey Primary League Player Registration Card. The Referee shall include details in his match report to the League. A Club that fails to produce a Surrey Primary League Player Registration Card for a player or substitute playing in a match shall be liable to a fine not exceeding £100. (R) All Player eligibility issues shall be brought to the immediate attention of the opposition Club Representative and reported to the match Referee (whether qualified or not). The complaining Club shall submit a report to the League Secretary no later than three (3) days following the playing of the match, giving full details of the discrepancy as per Rule 15(A)(i). The Referee shall include details of the complaint in his match report to the League. (S) (i) A Club that has more than one team in a specific Age Group may Transfer players between their teams. The team the player wishes to transfer to shall submit a transfer form to the Registrations Secretary accompanied by a fee of £5. A player may not be transferred to another team within the same Club and Age Group after 31st January except by special permission of the League Management Committee. (ii) A Club that has more than one team in the same Age Group shall be allowed to play a maximum of two (2) players who are registered to a lower ranked team in that Age Group and not from another team playing in the same Division or higher Division. These players will be referred to as a ‘Temporarily Transferred Player’. Any player in breach of this Rule shall be deemed ineligible to play and Rule 8(M) (i), (ii) and (iii) shall apply. In the event of an objection to a transfer the matter shall be referred to the Management Committee for a decision. (iii) In the event of a match not being played or abandoned owing to causes over which neither Club has control, it shall be played in its entirety on a date to be mutually agreed by the two Clubs and approved by the Management Committee. Failing such agreement and notification to the (Fixtures) Secretary within  days the Management Committee shall have the power to order the match to be played on a named date or on or before a given date. Where it is to the advantage of the Competition and the Clubs involved agree, the Management Committee shall also be empowered to order the score at the time of an abandonment to stand. (vi) A club may apply for a fixture to be postponed NO LESS THAN 14 days from the scheduled fixture date. Request received less than 14 days before the fixture date will be rejected. Only one (1) postponement shall be permitted in a season. For the purpose of this Competition only Nike Charter Standard Match footballs can be used. In the event that a Nike Charter Standard Match Ball is not used it must be reported on the match card and may result in a fine of £10.00 to the Home team only (from 2018/19). This rule is intended to standardise and improve the quality of match footballs used within the Competition and thereby enhance the football experience for all participants. Any breaches of Competition Rules will be determined by the Management Committee and misconduct by individuals or Clubs will be referred to the County F.A. to which the Club is affiliated. (B) Automatic promotion shall be applied for the first 2 Teams and automatic relegation shall be applied for the last 2 Teams in each division except as provided for here under, subject to the provisions of Rule 2(B). (D) In the event of a Team withdrawing from the Competition before completing 75% of its fixtures for the Playing Season all points obtained by or recorded against such defaulting Team shall be expunged from the Competition table. For the purposes of this Rule 12 (D) a completed fixture shall include any Competition Match(es) which has been awarded by the Management Committee. (B) (i) In cases where there are no officially appointed Match Officials in attendance the Clubs shall agree upon a referee. An individual thus agreed upon shall, for that game, have the full powers, status and authority of a registered referee. Individuals under the age of 16 must not participate either as a Referee or Assistant Referee in any open age competition and individuals under the age of 14 must not participate either as a Referee or Assistant Referee in any competition. Referees between the ages of 14 and 16 are only eligible to officiate in competitions where the players’ age band is at least one year younger than the age of the Referee, for example, a 15 year old Referee may only officiate in competitions where the age banding is 14 or younger. 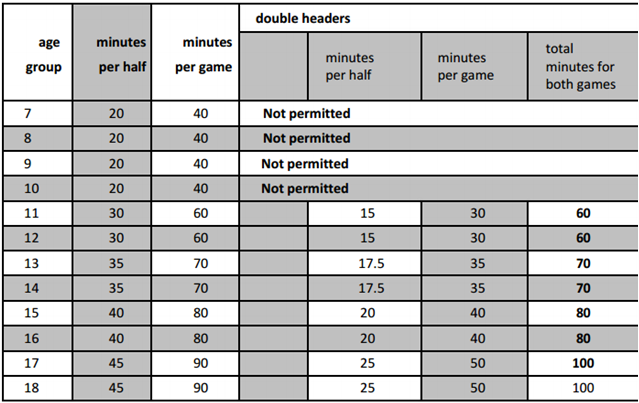 (D) The Management Committee will review and consider the readmission of teams with a combined/average fair play score less than 4.00 at the end of the previous season.